Monisha Kaltenborn became the first female team principal, as head of the Sauber outfit when the eponymous team owner retired. She gained a high profile during her time at Sauber, particularly through good handling of the media and sensible strategy and driver decisions. Monisha navigated the team through several financial crisis situations but eventually left the team midway through 2017. Monisha was born in India, but moved to Vienna when she was young, allowing her to hold dual citizenship in both countries. She studied law, gaining a masters’ degree from the London School of Economics. She worked for several law firms, as well as for several United Nations commissions regarding trade and development. Monisha worked for the Fritz Kaiser Group just before the millennium, and as co-owners of the Sauber F1 team, Kaiser put her in charge of the legal affairs for the Swiss outfit. She gradually made her way up the order, becoming a member of the Board, and then taking on the CEO role in 2010. 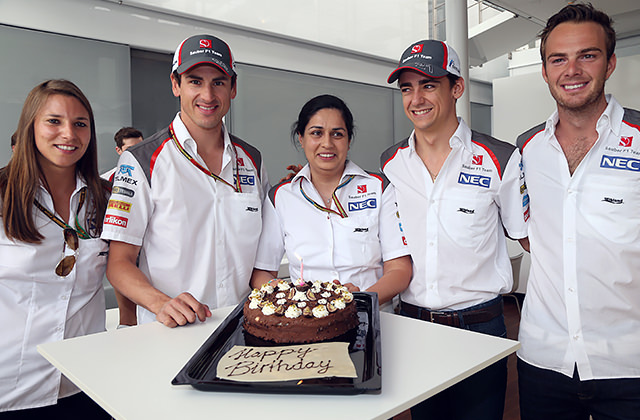 As part of his transition out of Formula One, team owner Peter Sauber transferred one third of the team to Monisha, and installed her as team principal as he retired in 2012. Kaltenborn thus became the first female team principal in the sport, and has been at the helm since then, guiding Sauber through some difficult financial times. In mid-2016, both Peter Sauber and Kaltenborn sold their shares in the team to Longbow Finance for some much needed funding for the squad. However, Kaltenborn remained as CEO and Team Principal under the new owners until 2017. In June of that year, it was confirmed that Kaltenborn and Sauber had parted ways with immediate effect "by mutual consent and due to diverging views of the future of the company." Monisha Kaltenborn watches on from the Sauber pit wall as Pastor Maldonado crosses the line - the only driver that can knock Sutil out... and he doesn't do it. Happy Monisha! A hot topic at the moment is how the sport is being received by fans attending the actual events, with Germany's grandstands worryingly empty. A question about this was posed to the team bosses in the FIA press conference today, with Sauber's Monisha Kaltenborn answering very eloquently. "It is, of course a concern because Germany has a strong history in motor sport and we have and have had some great drivers from there, so it’s an important market by all means and I think that that just shows that we really need to look at our product, our sport – which is a fantastic product, comparable to any big, global platform, comparable even to football or the Olympic Games - and see how we can connect better to the people outside. "It’s not about the product itself. We’ve had some fantastic races and we’ve had some bad races and that you have in every sport. You can have a fantastic tennis match or a bad tennis match, but it’s how you connect to the fans out there or to the consumers and I think that’s where we need to improve." Esteban Gutiérrez faces a three place penalty this weekend, which should drop him down to 17th place, depending on Hamilton's fate of course. The Sauber driver put in a better qualifying performance this weekend, however, and the results don't really show that. Adrian Sutil also looked more comfortable in the car, although his fastest lap was stopped by the red flag and he didn't get to improve out of the bottom six.The team have been very cagey about whether they've had FRIC suspension on the car or not - with Monisha Kaltenborn ruffling feathers and saying they aren't taking it off (because it's not on?) and Adrian Sutil was also unable to keep a straight face when talking about it.Could it be the other teams have fallen a slight step backwards due to tweaking their suspension setups whilst Sauber have remained the same? Still not great, but comfortable in their suspension setup. The FIA have confirmed that no F1 teams intend to run front-and-rear-interconnected suspension systems this weekend. As part of his preliminary scrutineering report, technical delegate Jo Bauer noted "For information purposes, I can confirm that no car is fitted with a front to rear linked suspension system of any sort. "This flies in the face of suggestions from Sauber team principal Monisha Kaltenborn to media today that her team wouldn't be making any suspension changes between the last race and this one. Of course Sauber may not have implemented such a suspension solution, or perhaps theirs differs enough not to fall foul of this mid-season shake up. Almost missed a cake status update. Monisha Kaltenborn picked up this scrumptious looking baked good for her birthday on Saturday. Underachiever of the weekend features close competition between the Toro Rosso and Sauber teams this week. STR appear to have lost all of the pace they showed in opening races, only managing to scrape a 14th and a last place for the efforts in Barcelona.Sauber meanwhile arrived at the circuit with a significantly lighter chassis, which should have delivered major performance benefits, yet they only managed to roll in 16th and 17th. Team principal Monisha Kaltenborn notes that this year's Pirellis are giving them the most trouble, "We have to get a more profound understanding of how to best use the tyres." Some insight into Sauber's performance troubles thanks to Sky Sports Ted Kravitz. 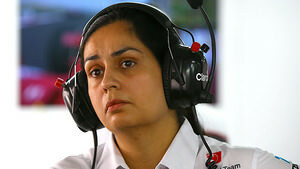 He reports team principal Monisha Kaltenborn said "We are nowhere, but the good thing is we know why we are nowhere. "She went on to explain that the base of the car is essentially good, but there is a weight issue, brake-by-wire issues, a specific aerodynamic issue and more to come from the power unit. Fans can expect a significant improvement from the team by the Spanish Grand Prix in May. Monisha Kaltenborn: "We've certainly made progress from Melbourne, we still aren't quite there but the measures we brought here have worked. It's a small step but a step in the right direction. Obviously, Adrian wasn't happy with a few things this morning. Otherwise we're pretty fine with the direction we're going. "It's very pleasant to work with Sutil, you need to have a good basis. He's critical about things but that's his job. A very different character to the drivers we've had before and it helps that he's not too far from the factory, he's built up a good relationship there. I think we'll get a long way ahead together. "Esteban had a first rough season but I think he's learnt a lot, and that's what that season was there for. He makes his experience, he learns from the mistakes he's made and we'll see how he delivers this year, we'll see how he makes use of what he's learnt."